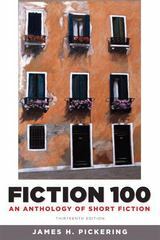 Fiction 100 13 Edition For Introduction to the Short Story and Introduction to Fiction. A collection of carefully chosen, interesting stories with literary merit, the best-selling text-anthology Fiction 100 continues to offer instructors the flexibility to organize their courses in a format that best suits their pedagogical needs. Intended to ignite students' curiosity, imagination, and intelligence, these selections represent a wide variety of subject matter, theme, literary technique, and style. International in scope, it illustrates the development of short fiction from the early 19th century to the present day, and features 128 traditional and contemporary works organized alphabetically by author.